Sport of Disc Golf is approaching the edge of professionalism. During the last few years the player talent pool has become much wider and better. Big Disc Golf tournaments are showcases of extraordinary skills. There is a handful of players aiming for a professional career in Disc Golf. Professionalism is finally raising its head. I have been full-heartedly involved in Disc Golf for more than 19 years now. During that time this small sport has evolved by leaps and bounds. Our course and player base has multiplied. As long as I have been involved in the sport, my focus and interest has been on the competitive side of the sport. I joined the PDGA in 1998 and signed as a pro. As an international member, there was only one division (MPO) that was organized at tournaments, especially in Finland and Sweden. This article is about Professional Disc Golf. What is it exactly? To understand it, we need to look where we are at the moment. There is the PDGA (Professional Disc Golf Association). PDGA is commonly understood incorrectly as a pro-only organization. 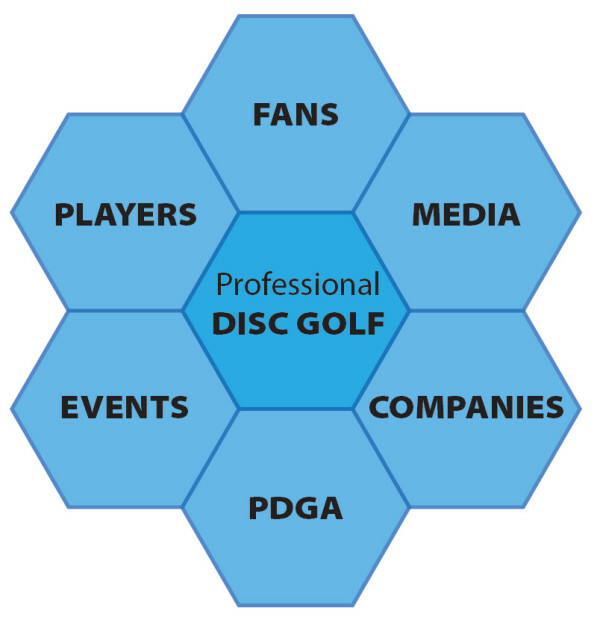 Many think that all PDGA members are professionals. In fact, the PDGA has 19,000+ active members and majority of the members are amateurs. And when we talk about real pro players (who earn enough money to compete only) the number will drop significantly. There are only 20-25 so-called professional Disc Golfers in the world. Professional Disc Golfer is really exclusive thing at the moment. To put it into perspective, there are much more private household chefs in the U.S. than pro Disc Golfers. Source: Forbes.com, Jacqueline Smith, The Most Common and Rarest Jobs In The U.S. There is a lot of talent required to play any professional sport. Why LeBron James is playing basketball and Leo Messi plays soccer? The biggest talents are dragged by the major sports very early. This is because of the money and image. Its cool to be a basketball star. We can’t immediately affect the economics, but we can work with the image. Would a dad or a mom like to take their son to the Disc Golf course where men in their 40s and 50s are smoking and drinking? Would a sponsor want to support that? We need to work harder towards making our sport attractive and interesting. Think about our Disc Golf businesses. How many manufacturers, pro-shops or retailers are ran by a Disc Golfer? All. This means that Disc Golfers are running our business. Are they real businessmen? A former Disc Golfer can be a great businessman, but how often they run their business by their disc-golfer-heart doing everything towards inside the sport, not outside? Most of our Disc Golf businesses are ran by amateur businessmen. We are not “there” yet. Over the years, there have been rumors about big companies like Nike looking to enter the Disc Golf business. Personally, I highly doubt that has ever happened. When Nike entered to the skateboarding market in 2002, only the board business was worth of $106 million in US. We are not “there” yet. For me, the Media part is maybe the most interesting topic. Like all the six elements, the Media should have its own article. Generally, the main media is professional. Challenge is that we are competing with so many other news and happenings that cracking the surface is really hard. Disc Golf being side by side with major sports on ESPN news might never happen. Instead of banging our head to the wall of main media we need to be creative. We need to create our own media that will reach our viewers and listeners with our ways. We have few Disc Golf medias like Disc Golf Planet and SpinTV. Still, not too many are working professionally in Disc Golf media. We are working with a very unique sport. From the professional sport point-of-view the dilemma is that Disc Golf is free-to-play. While it is great that we can enjoy a round with our friends with no admission, it’s also a really hard to turn it into a business. Can you think of free-to-play golf courses? Or even mini golf tracks? What if Ed Headrick would have made the first Disc Golf course pay-to-play? Would we play pay-to-play Disc Golf only? How would our sport look now? Free-to-play model is great when we want to expand but hard when we need to make it as a business. There is one great example of pay-to-play Disc Golf: Järva DiscGolfPark. This fine piece of land just inside Stockholm city area in Sweden has been a mecca of European Disc Golfers since 1996. Course owner Mats Löf has put enormous amounts of time to make that property into a pro pay-to-play Disc Golf Park. Year after year, it draws players around the Stockholm, Sweden and even from other countries. It is worth mentioning that there are around ten free courses (some really good ones) close to Järva, so people are ready to pay for an experience, manicured course and professionalism. Learn more about Järva DiscGolfPark here: www.discgolfpark.com. Over the years, one topic has risen on top every year: the money. Many people, especially the MPO players are requesting more money to the top level pros. These dedicated people are spending majority of their time (even lives) on this game. They are road warriors who pile up miles on the road. And they deserve more. A great player may earn average of $1,000 in prize money per event. Not to mention that he/she pays all the expenses. There is hardly enough money to feed the very best of this Sport. And 90% of the money is coming from the other players (lesser pros). Often the PDGA is facing the critique – they are The Professional Disc Golf Association and they should take care of the pro players. Lets talk about the PDGA here for a while: What really is the PDGA? (PDGA) is a membership organization dedicated to the promotion and sustainable growth of Disc Golf. It promotes the sport through player participation, tournament development, spectator participation, course development, rules and competitive standards, media and sponsor relations, and public education and outreach. This description is from the Wikipedia. The PDGA is the governing body of the whole sport. The PDGA is dedicated to the sustainable growth of Disc Golf. As stated earlier, pro members are the minority in PDGA. Why would the PDGA need to concentrate on them and specially gather money to very few of their members? Is that sustainable? PDGA’s role is very important as the sport grows. PDGA needs to build the base for the whole sport and its 19,000+ members. PDGA’s executive director Brian Graham and his staff are working countless hours to make the membership processes more fluid, tournament registration solid, results and member services better. This crew is overseeing 4,000+ courses directory, managing 1,800+ tournaments and 19,000+ members. This is their primary mission. They also run the PDGA National Tour in the U.S. and are involved in the PDGA World Championships. If we look at their duties from this perspective, I think they are doing a pretty darn good job. Are they also fully responsible of the lack of sponsorship money in this sport? What if there were no PDGA or any organized tour? Would there be any professional players? Where are all the professionals in Disc Golf? We do have a handful professional players like Paul McBeth. He is dedicated and talented pro, and he is there only for the game. It is actually quite easy to be a professional Disc Golfer: you just join the PDGA, take the officials test and register early to almost any tournament. Boom. Now, you are lining your drives with McBeth. Awesome. This is possible only because we are not a professional Sport. Yet. So, naming McBeth as a pro Disc Golfer is 100% correct. But there is no professional Disc Golf yet. This statement needs to be opened up. How many professionals there are in Disc Golf? PDGA has around 10 employees. That is less than a regular golf course staff in US. And there are 16,000+ golf courses. Disc manufacturers are employing roughly 100 people in the whole world. There are twice as much office workers at FC Barcelona. (Well, that´s the 3rd biggest soccer team in the world.) What about professional disc golf promoters? Anyone? I think Jonathan Poole is one of the very few that can say he is working professionally (=getting paid) to make Disc Golf events as a TD. There might be a few others too. This is the main reason why we still do not see the professional Disc Golf. All the organizer talent flows to business world. Just like all the player talent flows to the major sports. There is not enough money in this sport. Making a professional event where both spectators and players are treated great is not a side job. It’s a full-time job. As long as we do not find the formula where promoters and TDs can earn their living, we are stagnating. Now, when the year 2013 is coming to an end and we are looking to 2014, I’ll make a promise: I will be concentrating more on the promotional side of the sport in 2014 and 2015. I want to give back to this sport that has given me so much. There are several projects that I want to push forward this upcoming season. The results will be starting to show in few years. We need to be patient. One thing I’m really waiting: when people realize that instead of focusing on the top level pros (and the money) they should concentrate on grass root amateurs and spectators. From now on I will call them all Fans. Disc Golf Fan is the single most important piece of the puzzle. Before we see any real professional Disc Golf, we need to see the fans. Anything else is unsustainable. Think about any other major sport and how they put their fan in the center. Sure, there are the pros and the sport, but look what there is for the fans. Everything is aimed to the fans. The fan designates the future of our sport. This is the main reason why we still have same purses on the biggest events on tour. We need to build our tournaments and promotions to the fans and future Disc Golfers. We need to turn Disc Golf into a interesting sport of the future. When you get the fans, you’ll get the rest: the media, the sponsors, the sales. Next summer, there will be at least one Disc Golf tournament that will concentrate on the Disc Golf fans and it’s run professionally. You should check out the European Masters in Sweden next summer. I guarantee it will be a show. http://www.mastersdiscgolf.com. Writer is 1030+ rated disc golf pro, who got introduced to the great sport of Disc Golf in 1994. He has been playing disc golf competitively in 4 continents, in 13 countries, for 18 years now. As a Tournament Director, he has run 50+ tournaments including 5 majors. He’s been lucky enough to get to meet people who have invented beveled edge discs, reinvented the disc golf target, and pioneered this sport for decades. Writer has done his bachelor’s degree in marketing and entrepreneurship and currently runs his own Disc Golf business that operates around the world and employs a dozen disc golf enthusiasts. 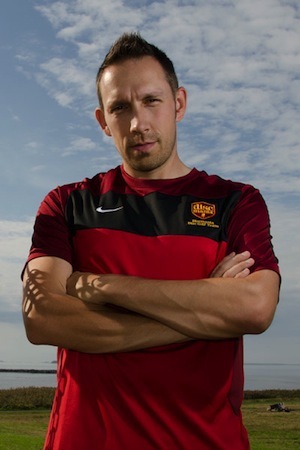 Follow Jussi on Twitter here.